Fairly familiar territory, 1890's gothic horror adapted for the big screen many times over. Francis Ford Coppola had a go and changed a few things in 1992, making Dracula a hero rather than a villain. 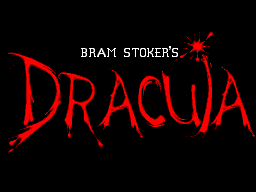 It's a film made into a game so hopes should not be too high, but would Bram Stoker be spinning in his grave at this game? Let's find out. 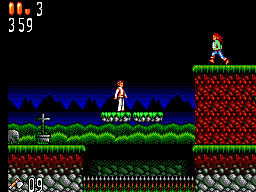 It's a standard enough platformer, run, jump, attack, boss at the end of a level. Creepy castles, check. Various weapons to attack enemies with, check. Spikes out of floor and ceiling for no apparent reason, check. 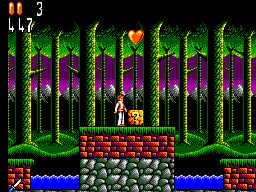 Standard scrolling 2D platformer of the late 80's/early 90's? Yep. Definitely some serious effort has gone into these. Harker himself looks every inch the hero of sorts that he's supposed to be and the undead, well they are just themselves. Having never seen a member of the undead up close, I can't comment on whether they are accurately represented in 8 bit form. Creepy in a 1980's childs keyboard sort of way. Creates a suitably creepy atmosphere without going overboard. He runs, he jumps, he......flings things about. In all honesty the controls in my opinion are really nice and responsive. Typically this is one area that can make or break a platform game but there are certainly no complaints here. Not hugely difficult but not frustrating either, there is plenty to keep coming back to. This for me is always the game I go back to when all the others have frustrated me, and believe me that's quite often. I think we have a miracle here, a movie tie-in game that is actually very good. One of the most underrated platform games on the system, definitely one to be added to most collections. My copy was �3 and was probably the game I have played most out of everything I own. Even if you wouldn't normally play a game that is based on a film, you will find lots to like here.